Interview: Jayne Anne Phillips, Author Of 'Quiet Dell' In 1931, Harry Powers killed two women and three children at his home in Quiet Dell, W.Va. Writer Jayne Anne Phillips learned about the murders from her mother, who was a child when the deaths became a media sensation. Phillips' new novel retells the tragedy through the eyes of a young reporter. 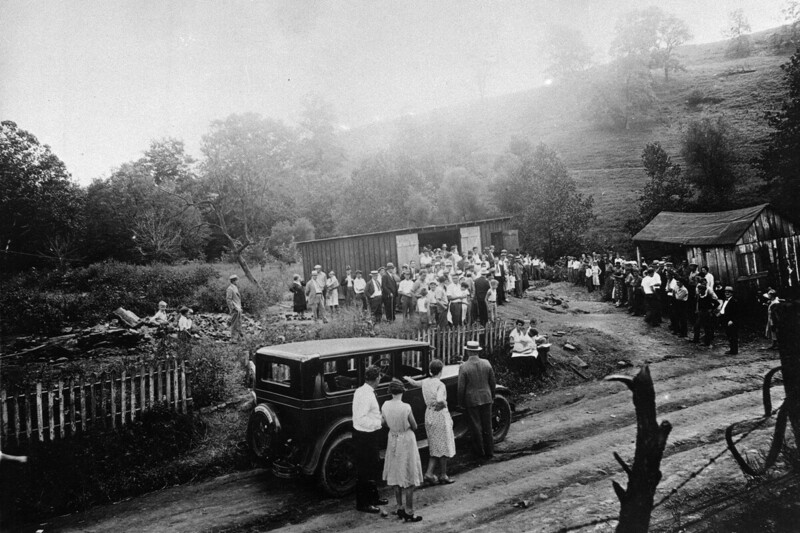 Crowds gather on Aug. 30, 1931, at the site of the Quiet Dell murders. Evidence of the killings was found in and around murderer Harry Powers' garage (center). The Quiet Dell murders were among the first big, sensational crime stories of the Depression: A serial killer corresponded with vulnerable widows he met through lonely hearts clubs, then lured them to their deaths. As a child, writer Jayne Anne Phillips learned about the murders from her mother, who was a child in 1931, when the murders took place. Phillips says she didn't talk a lot about the tragedy, but whenever they drove close to where the crime occurred — near Clarksburg, W.Va. — her mother would say, "There's the road to Quiet Dell." 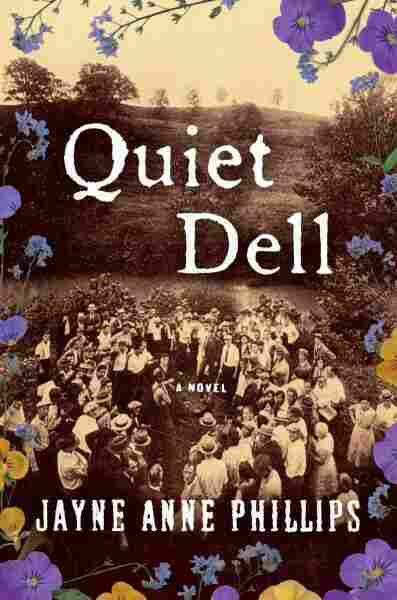 Phillips' new novel, Quiet Dell, revisits the murders. She says that after hearing her mother's recollections, she developed a strong connection to the sensory details of the story. "The long, dusty road; the heat of August; cars lined up as far as she could see; being very small and huge crowds of people; hearing the sound of them taking apart the murder garage for souvenirs — the whole experience was something that stayed with me," she says. Murderer Harry Powers killed two women — Dorothy Lemke and Asta Eicher — at Quiet Dell, along with Eicher's three children. Phillips opens the book with a vivid portrait of the Eicher family, imagining what their lives might have been like in the weeks before they were killed. She says she felt a responsibility to the children. "The tragedy of their loss was somehow answered for me in the process of writing them," Phillips says. "They became real to me and alive and saved, in a sense." Phillips uses the character of Emily Thornhill to fill in the details of the investigation into the murders and the trial that follows. Emily, a young woman from Chicago, is one of hundreds of reporters who descend on Quiet Dell in the weeks after the murders. She is determined to find out as much as she can about the children and the man who killed them. "She wants justice for the family," Phillips says. "She wants it known what happened to them. And in her own life, which is rather separate from her job, she remembers them. And of course the reader comes to see that having been involved in this case changes her life forever in ways that she could not have expected or predicted." "Quiet Dell is beautiful, the trees at once gently riffling their great canopies, leading like stair steps up the sides of densely scented hills, ridge over ridge, as far as she can see. She looks back to find the others, but the garage building is a black hole. She hovers there and sees grasses and roots grow toward it at lightning speed, rushing and meeting and growing up, a fountain of green, for years are passing and the urgent land hums and flows, erasing the harrowing dark." 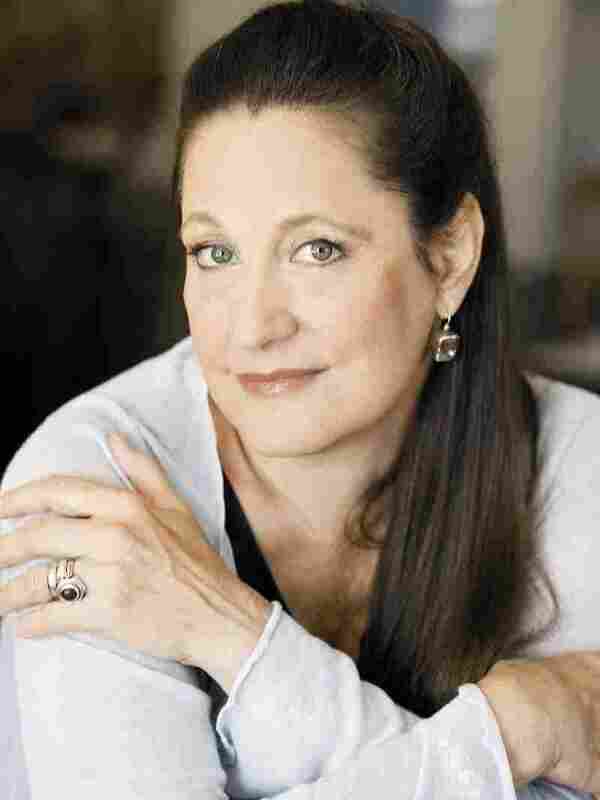 Jayne Anne Phillips' previous novel, Lark and Termite, was selected as a finalist for the National Book Award in fiction in 2009. "She doesn't appear to anyone," she says. "She can turn in the breath of a thought, she can move in and out of time. She sees things that may be, or things that will be, so it's more almost a physics problem, you know: Where does all this energy go, especially in the case of very sudden deaths?" But it's Emily's story that dominates the narrative. Through her involvement in the case, her world expands: She finds new friends and new people to love — people who help in her quest for justice for a family she never even knew. "We do know that in desperate circumstances people are bound together so deeply," Phillips says. "And, in a sense, all these lives that are sort of pulled together by the tragedy are a testament to these children, because everything going forward for all of these characters is marked by the goodness of these children and the fact that these characters protected and defended them when they could not do that for themselves." Asta Eicher and her children could not be saved, but Phillips hopes that by remembering them, by imagining the lives they lived and the people who were their champions, she has played her own small part in shedding light on a dark corner of history.